I worked in the beauty business for many years before I took the plunge to be self-employed and paint murals. From that, I worked my way into one of the things I do at present, which is children’s book illustration. I mention that because, my first “career move” had some roots in the fact that my dad told me I wasn’t very talented at drawing … and I stupidly believed him. However, determination goes miles over “talent” every time. 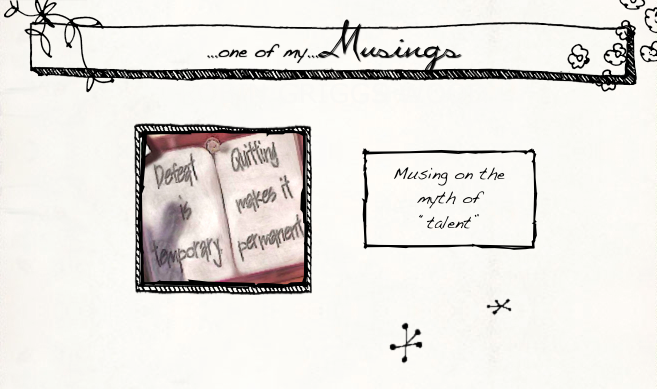 Talent is a grossly misunderstood thing. Much of what is taken at face value as talent is really just a conglomeration of education, persistence … and lots of hard work! A real artist is made. He makes himself. All it takes is to be damn unwilling to be otherwise. I wanted the ability that I have now and so I persisted and trained and worked at it until I was in tears (often literally). Essentially, you are an artist if you wish to create something that communicates something more than its component parts, no matter your choice of media. I ducked that first vocation and now I draw and paint all the time, because at some point I had the luck to realize that “talent” is a myth. If I can do it, anyone can. You only have to want it — then work at it — and it is yours. No one has to be left out.